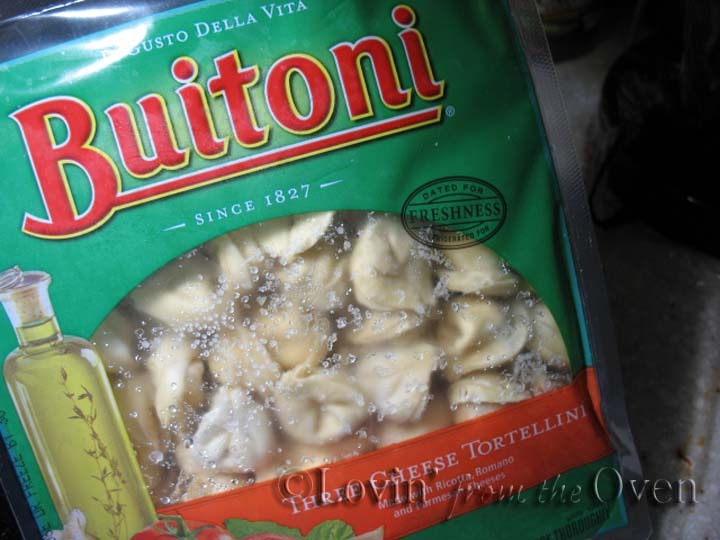 During the summer, I received a coupon from Buitoni and FoodBuzz to try a pasta of my choice. I chose their fresh tortellini. Did you know that you can freeze fresh pasta? I became very busy this past summer and stuck this in the freezer. Recently, Girlichef took tomato soup up a notch, roasting her tomatoes and adding cute little cheese sandwich croutons. 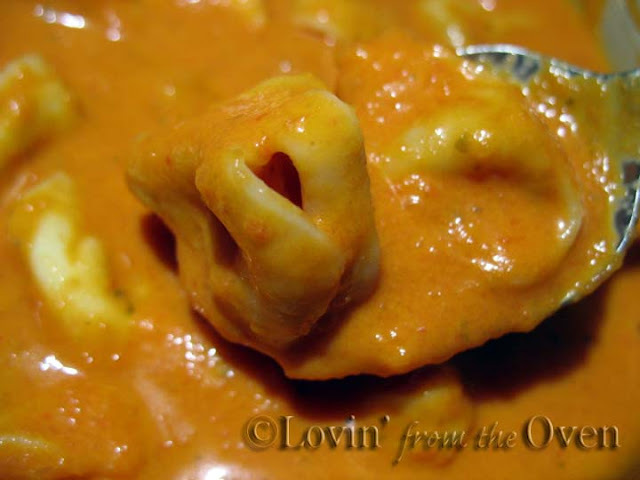 I made a creamy tomato soup at my last Christmas dinner , and thought, why not roast the tomatoes and add tortellini? Roasting tomatoes are easy. I gathered four pounds of vine tomatoes, washed and quartered them. Put them on a baking sheet and drizzled them with olive oil. Don't forget...you'll want to roast some garlic while you roasting the tomatoes. 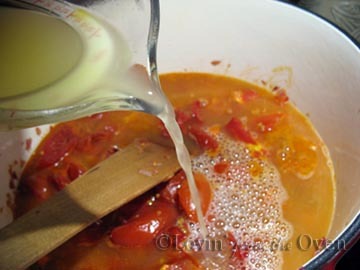 and add just a touch of sugar to sweeten the acidity of the tomatoes. The recipe calls for 1 Tablespoon of tomato paste. 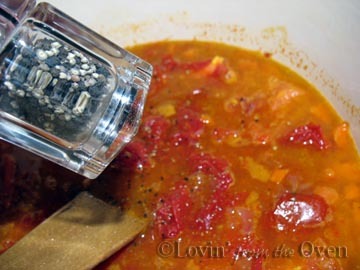 Tomato paste adds a punch of tomato flavor to any recipe. Why waste a whole can when you can freeze it? 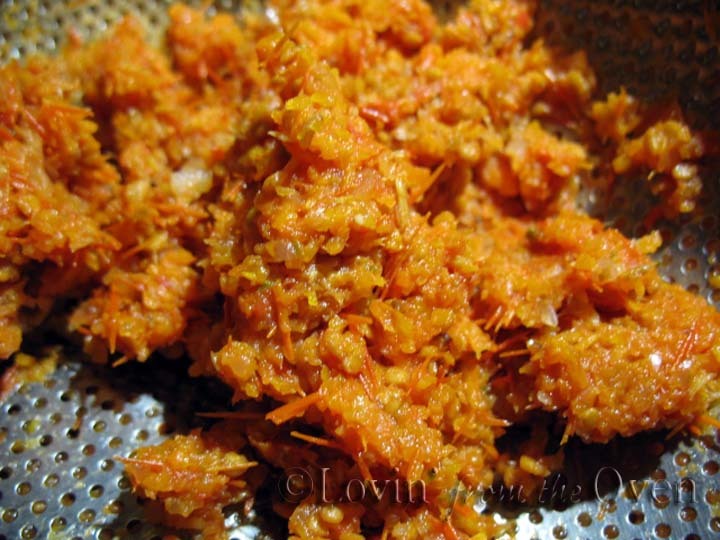 This POST shows how to freeze tomato paste. Don't worry, you can use pesto. 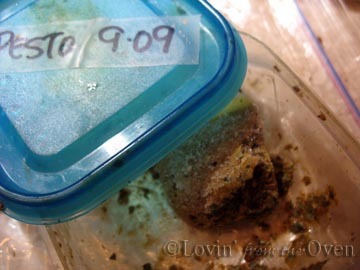 I froze some in some ice cube trays and other containers last year, thanks to this tip from Kaylyn's Kitchen. I love to use the McCormick's chicken base and keep it in my fridge. Freshly ground pepper is good, too. Okay, this is where my $10 immersion blender comes in. If you don't have one, use a food processor, blender, or food mill. Unless you have a blender that can pulverize everything, you can strain this. Using a rubber spatula and pushing it through a coarse strainer, this is what is left behind. You could always skin and seed your tomatoes using this method. Fresh, creamy, roasted tomato soup. It was fabulous in this soup! 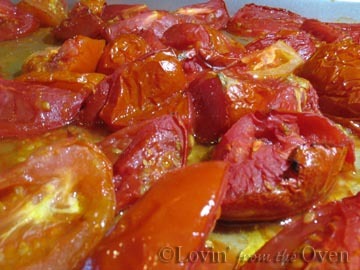 Put tomatoes in a single layer on a foil lined baking sheet. 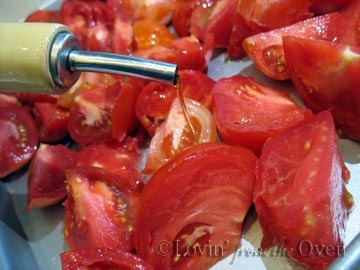 Lightly drizzle tomatoes with olive oil. Bake in a 325ºF oven for about an hour. 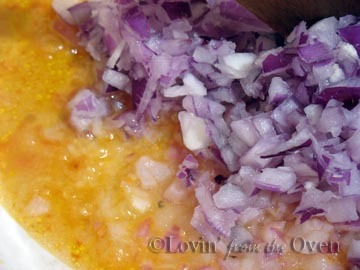 In a large dutch oven or soup pot, combine olive oil, red onions and carrots. Add garlic at this point. If using roasted garlic, save it for the end of the dish. Saute for about 10 minutes, or until tender. Add tomatoes, sugar, tomato paste, basil, stock, salt and pepper and stir well. Bring the soup to a boil, lower the heat, and simmer, uncovered for 30-40 minutes. Add roasted garlic. 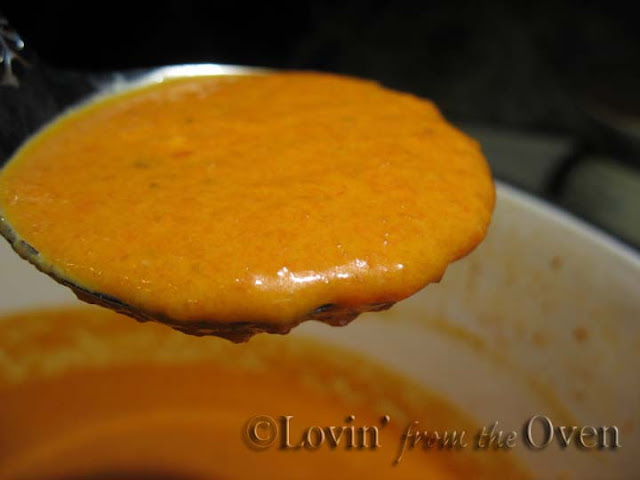 Puree soup with a blender, food processor or food mill. If using a blender or processor, push soup through a medium strainer that will leave residual skin and seeds behind. Reheat soup over low heat until hot and serve with basil leaves and/or croutons. Soup, glorious soup! And with the tortellini in it... fabulous! I freeze fresh pasta too. So nice to have on hand when you can't think of anything else to make. 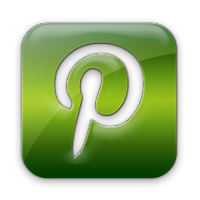 Thanks for your comment on our blog! LOVE yours!!! You have some amazing recipes! 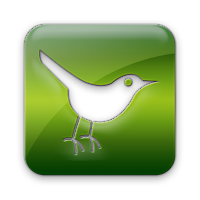 I am now following!